Quill City Mall Kuala Lumpur, in partnership with Twentieth Century Fox, is honored to present the unBULLievable Christmas at Quill City Mall KL by integrating the most anticipated movie FERDINAND concept with the Christmas celebration this year. FERDINAND is a movie by Twentieth Century Fox. FERDINAND tells the story of a giant bull with a big heart. Unlikely a usual bull, FERDINAND loves flowers more than bull fighting. After being mistaken for a dangerous beast, he is captured and torn from this home. Determined to return to his family, he rallies a misfit team on the ultimate adventure. Set in Spain, Ferdinand proves you can’t judge a bull by its cover. This Christmas, Quill City Mall KL has transformed its Main Atrium into an Andalusia Spanish Village with Christmas Floral theme which is inspired from the scene in the movie Ferdinand, providing shoppers an unforgettable experience from the movie scene. 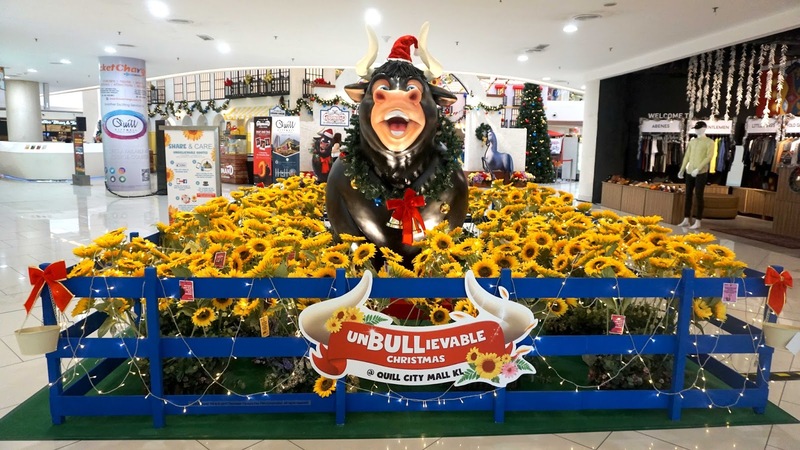 Shoppers will also experience 3D Ferdinand at Sunflower farm and a gigantic 40-feet tall LED Christmas tree with Ferdinand inspired elements as decorations. In addition, shoppers will get to experience momentous experience of photo opportunities of the exact scene from the movie. The Grand Launch officiated by YB Dato’ Sri Rohani Abdul Karim, Minister of Women, Family and Community Development (KPWKM) and accompanied by Dato’ Ar. Michael Ong, Group Executive Director of Quill Group of Companies, Ms. Moo Hon Mei, Marketing Director of Twentieth Century Fox, Mr. Ng Chee Kheong, COO of Quill Group of Companies, Mr. Alan Cheong, Centre Manager of Quill City Mall Kuala Lumpur and Mr. Joseph Teo, Vice President, Marketing of Quill City Mall Kuala Lumpur. The launch began with the opening performance by the UnBULLievable Cheerleading, a group of talented and energetic youngsters that captured the attention of the audience followed by the beautiful Christmas Song “Feliz Navidad” sang by Amelia Lee, youngest fashion designer. One of the event highlights was the 10,000 BIG Points Balloon Drop where the shoppers collected as many balloons as they could and burst it in order to redeem AirAsia BIG Points. 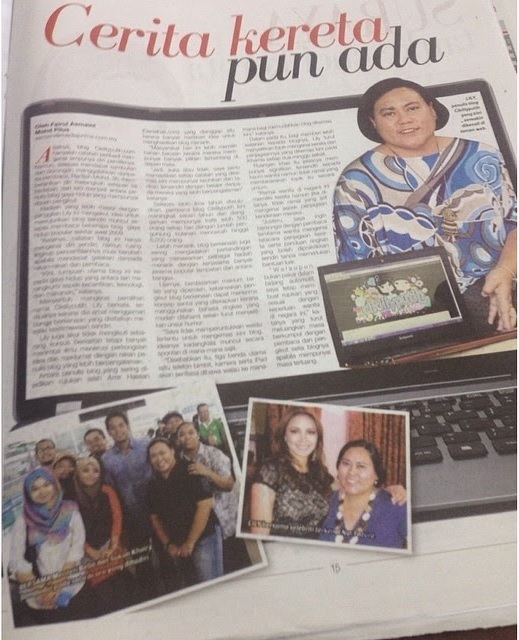 “It’s our great pleasure to host this year’s Christmas Celebration together with Twentieth Century Fox. We hope to continue our partnership with Twentieth Century Fox in many other exciting projects in the near future. This year, we have also welcomed 30 Single Parents from Cempaka Single Mother Club Malaysia and Kuala Lumpur & Selangor Revolution Self Development Association to host a Charity Bazaar in order to show our support towards them. 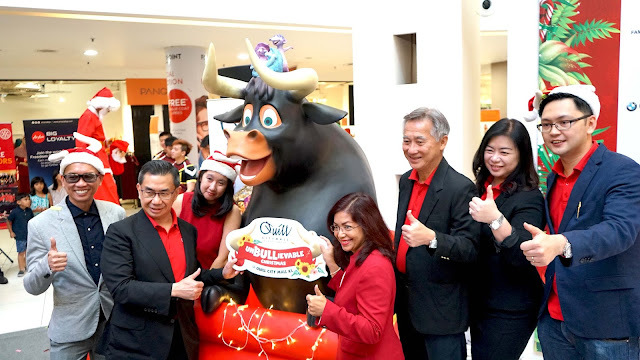 We want to encourage them to always BULLieve yourself that you deserved to be loved and accepted, just like FERDINAND proves that you can’t judge a BULL by its cover,” said Mr. Alan Cheong, Centre Manager of Quill City Mall Kuala Lumpur. In conjunction with Hari Keluarga, a group of 30 single parents from the Charity Bazaar received a mock board and goodie bags presented by Dato’ Ar. 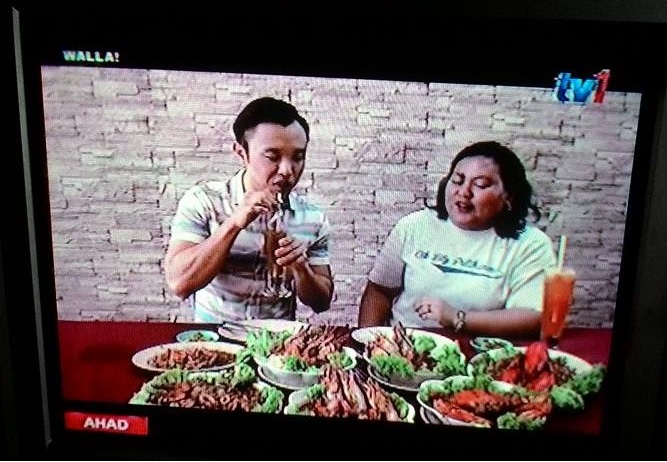 Michael Ong, Group Executive Director of Quill Group of Companies and witnessed by YB Dato’ Sri Rohani Abdul Karim, Minister of Women, Family and Community Development (KPWKM). This Charity Bazaar is available on every Friday to Sunday, starting from now to 1 January 2018 at First Floor Concourse in Quill City Mall KL. Over 30 vendors will be available selling cookies, apparels, bags & accessories, cosmetics and homemade items for Christmas shopping spree. In partnership with AirAsia BIG Loyalty, The Official Mall Loyalty Partner, shoppers can also participate in the unBULLievable BIG Giveaways through a minimum spend of RM40 in a single receipt at any outlet in Quill City Mall KL for a chance to win a pair of return flights to Melbourne, Sydney or Gold Coast and earn BIG Points. Contest period starts from now to 25 December 2017. Besides, shoppers get to redeem 2 BIG Points for every RM1 spent on weekdays and 1 BIG Point for every RM1 spent on weekends at any outlet in Quill City Mall KL. Members can accumulate points in exchange for air tickets, starting from 500 BIG points. T&C apply. Not to forget, interesting Christmas redemptions of Limited Edition Ferdinand Christmas Premiums such as Ferdinand Stationaries Set, Ferdinand Plush Keychain, Ferdinand Pillow and Ferdinand Backpack, with a minimum spend of RM50 in a maximum of two accumulated receipts awaits you at Quill City Mall KL. Parents, get a Ferdinand token for your kids by obtaining a free Christmas booklet comprising of lots of interesting things including attractive postcards from our Concierge Counter, Ground Floor. Shoppers can come here to get beautiful Christmas gifts for your family and friends. Free gift wrapping service is available at our Concierge Counter, Ground Floor. T&C apply. On another note, Quill Automobiles, Official Mall Automobile Partner, together with Quill City Mall KL organised a Guess and Win contest where shoppers can guess the number of Ferdinand Christmas Pillows in the BMW X5, which is located at the Main Atrium, Ground Floor, to stand a chance to win a unit of BMW Cruise Bike worth more than RM 5,000.00. Contest period is from now to 21 December 2017. T&C apply. 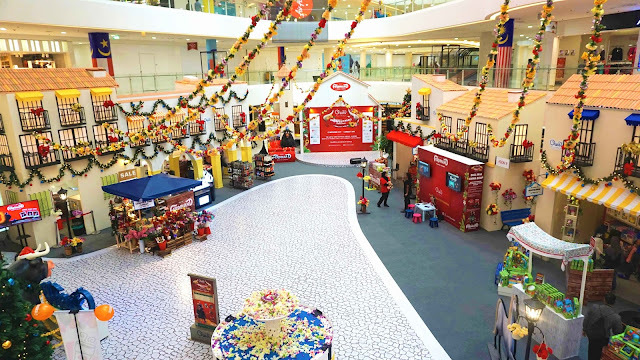 In order to create the positive vibe throughout this Christmas, Quill City Mall KL collaborated with one of their tenants, Cempaka Sari Florist, to have an unBULLievable Quotes Campaign whereby shoppers can redeem a Sunflower by snapping and sharing an image of positive quotes at Main Entrance Foyer, Sunflower field. 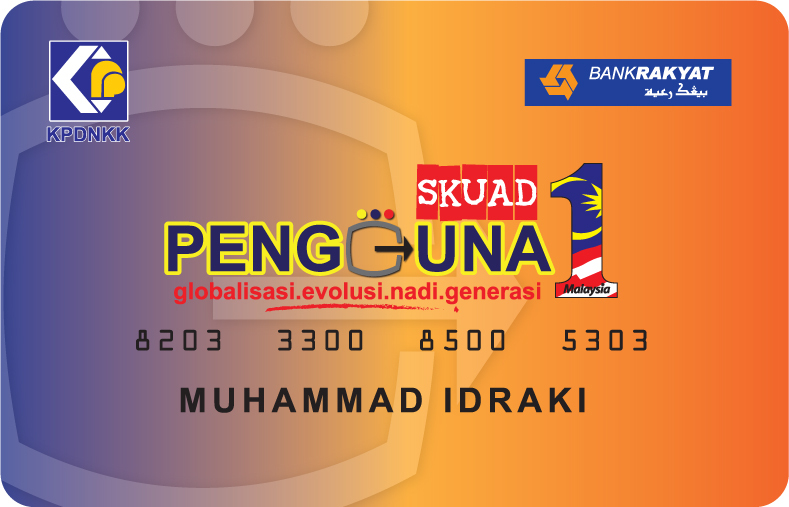 This redemption is valid from now to 1 January 2018. T&C apply. Every weekend, Quill City Mall KL has delightful activities and spellbinding performances such as unBULLievable Modern Dance, Football Juggling Performance, Spanish Themed Ballet, Ferdinand Bull Horn Headband Making Workshop, Ferdinand Kids Drawing and Colouring Competition, unBULLievable Christmas Party Kids Costumes & Talents Competition, Spanish Fun Activities, and many more. Also, shoppers can challenge themselves to win a Limited Edition Ferdinand Christmas Pillow through participating Ferdinand Games Booth at Main Atrium, Ground Floor. 5 winners will be selected based on top five scores every week. T&C apply. Also, come to experience the Inflatable Bull Rodeo Ride with your friends and family; we also have kiddies ride for the little ones as well. Come and spend the weekend with an array of interesting competition, workshops and performances lined up for you this festive season. Discover 100 unBULLievable Art Exhibition featuring Ferdinand related display of 100 units’ canvas art from 1 December 2017 to 1 January 2018 at Level 4 Concourse, 10:00am to 10:00pm. Come and witness the art by college students in conjunction with the premier of Ferdinand at GSC Cinemas in Quill City Mall KL. Stay tuned to our social media page to stand a chance to win the movie tickets. Last but not least, a heartfelt thanks to Quill Automobiles - Official Mall Automobiles Partner, AirAsia BIG Loyalty - Official Mall Loyalty Partner, mixFM - Official Mall Radio Partner, Viral Cham, Oh Bulan!, SAYS – Official Online Social Media Partners, Golden Screen Cinemas – Official Mall Cinema and to all mall partners, AEON, Beebit 3D Puzzle, Cempaka Sari Florist, Dunkin Donuts, Golden Gukak, Hamleys, Happikiddo, Golden Gukak, Cempaka Single Mother Club Malaysia, Las Lilas, Little Happiness, Rotaract & Rotary Club of Pudu, and SoxWorld. This unBULLievable Christmas is supported by Ministry of Women, Family and Community Development (KPWKM) and in conjunction with Malaysia YES Sales. 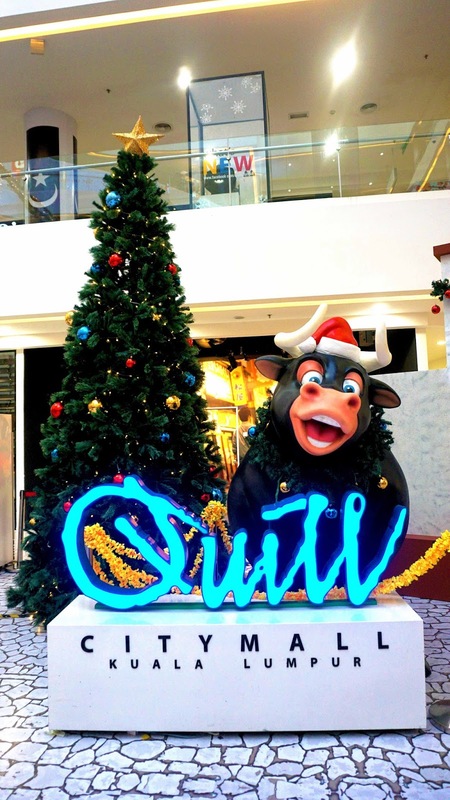 This Christmas, Quill City Mall KL is delighted to provide you and an unBULLievable Christmas experience and it is the best choice to gather with family and friends as shoppers can enjoy festive Christmas offerings from our valued tenants and Christmas vendors with various promotions ranging from food, fashion, entertainment and much more. Also, in conjunction with Malaysia Year End Sales, our outlets will be having marked down sales and promotions to cater to shoppers needs throughout this Christmas season. Spend this Christmas with us in Quill City Mall KL. Free parking is available after 5pm onwards on weekdays whereas RM3 flat rate on weekends. Let’s come to Quill City Mall KL to watch FERDINAND which screening from 14 December 2017 in GSC! 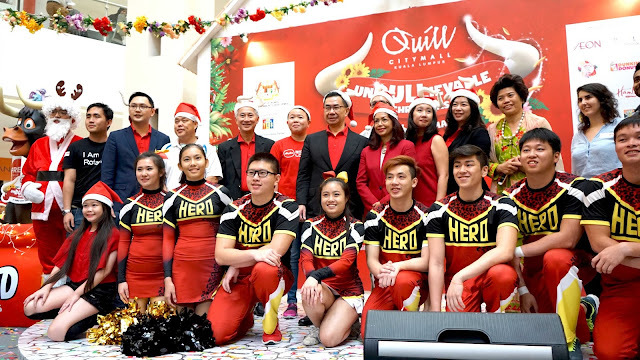 For inquiries and registration of Quill City Mall KL programs and promotions, visit our Facebook, Instagram: QuillCityMall KualaLumpur or our website http://www.quillcitymall.com.my.